Shock means several different things in the medical world. Besides an electrical shock (used to restart the heart) and a term for an extremely emotional state of mind (similar to post traumatic stress disorder), shock also refers to a condition where the body is unable to get enough oxygen and nutrients to important organs and systems. Shock, the medical condition related to adequate blood flow, takes many forms and has different patterns of signs and symptoms depending on which type of shock the patient is experiencing. There are four main categories of shock: hypovolemic, cardiogenic, distributive, and obstructive. Each of the different categories has multiple causes, and each of the causes comes with different signs and symptoms. The most common symptom to all shock—at least eventually—is low blood pressure. As untreated shock gets worse, the blood pressure falls. Eventually, the blood pressure falls too low to maintain life (called hemodynamic instability) and shock becomes fatal. Depending on the cause, it can take a long time or it can be very quick. While low blood pressure is the only symptom that is present at the end of every shock category, some categories of shock are much more common than others. That means their symptoms are also more common. Here are the categories of shock in order of frequency, with their common symptoms. Not having enough fluid or blood volume (hypovolemia), is the most common type of shock. As hypovolemic shock gets worse, the patient becomes lethargic, confused, and eventually unconscious. If external bleeding is the cause, there will be blood. If bleeding into the gastric system is the cause, the patient might vomit blood or have bloody diarrhea. If it's hot or the patient has been exerting herself, consider dehydration. This is the hardest category of shock to understand, but it is very common. When arteries in the body become flaccid and no longer can constrict properly, the blood pressure is very hard to control and will fall. The two most common causes for this type of shock are severe allergies (anaphylaxis) and severe infections (sepsis). Symptoms vary depending on the cause. Poor skin elasticity (turgor), which means if you pinch the skin it stays pinched and returns slowly back to normal, if at all. Sepsis is often a combination of distributive and hypovolemic shock because these patients are commonly dehydrated. 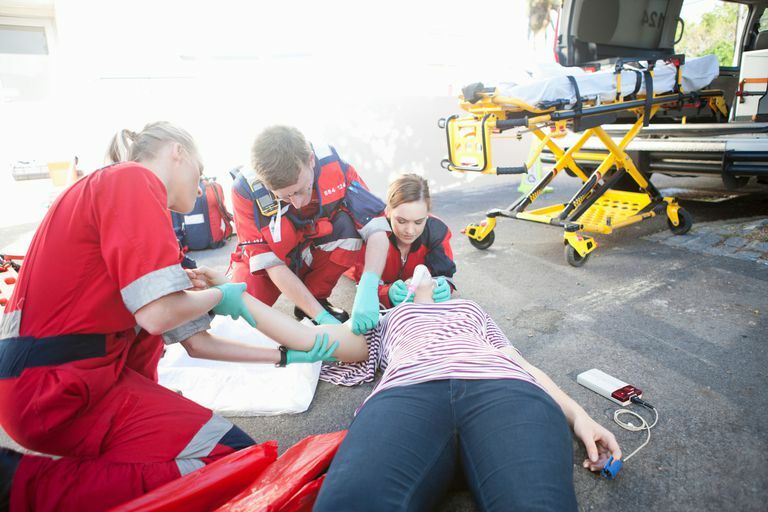 Neurogenic shock comes on after some sort of trauma, such as a fall or a car accident. Cardiogenic shock can be accompanied by the signs and symptoms of a heart attack. Probably the least common main category of shock (neurogenic is the least common specific type), obstructive shock comes from something pressing on the blood vessels inside the body. The most common cause of obstructive shock is from a tension pneumothorax (collapsed lung). Besides a tension pneumothorax, the other most likely cause of obstructive shock is from cardiac tampenade, a rare condition caused by blood trapped in the sack around the heart, pressing on it and keeping it from adequately pumping blood. Shock is a true medical emergency and should be treated as soon as it can be recognized. If you suspect shock, call 911 immediately and get to the hospital. As long as the body is managing to keep the blood pressure up, the medical community considers it compensated shock. When the blood pressure falls—even in cases when that happens early, such as neurogenic shock or obstructive—the medical community refers to it as decompensated shock. If decompensated shock is left untreated, it has a high likelihood of becoming fatal. Shock is extremely dangerous and one of the more complicated conditions to understand. The one thing to remember is that the body has to have a minimum amount of blood pressure to get oxygen and nutrients to the brain and other vital organs. Anything that gets in the way of maintaining that minimum blood pressure is a serious medical emergency. Cecconi M, De Backer D, Antonelli M, et al. Consensus on circulatory shock and hemodynamic monitoring. Task force of the European Society of Intensive Care Medicine.Intensive Care Medicine. 2014;40(12):1795-1815. doi:10.1007/s00134-014-3525-z. Summers RL, Baker SD, Sterling SA, Porter JM, Jones AE. Characterization of the spectrum of hemodynamic profiles in trauma patients with acute neurogenic shock.Journal of critical care. 2013;28(4):531.e1-531.e5. doi:10.1016/j.jcrc.2013.02.002. Kolte D, Khera S, Aronow WS, et al. Trends in Incidence, Management, and Outcomes of Cardiogenic Shock Complicating ST‐Elevation Myocardial Infarction in the United States.Journal of the American Heart Association: Cardiovascular and Cerebrovascular Disease. 2014;3(1):e000590. doi:10.1161/JAHA.113.000590.